Junior Section members from across Scotland experienced a night to remember at one of Scotland’s top visitor attractions. Almost 400 Juniors spent an evening and overnight at Glasgow Science Centre for the organisation’s ‘Juniors Giant Sleepover’ on Friday 2nd November. During the evening, the BB members experienced the state-of-the-art planetarium, live Science Show and hundreds of interactive scientific exhibits. The theme for the live Science Show was ‘Fantastic Forces’. 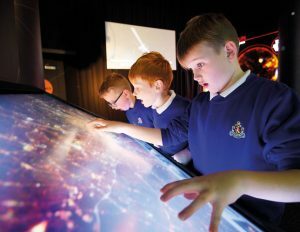 This is the sixth time that the BB has run its Science Centre event and in that time almost 2400 children and 600 adult leaders have attended.